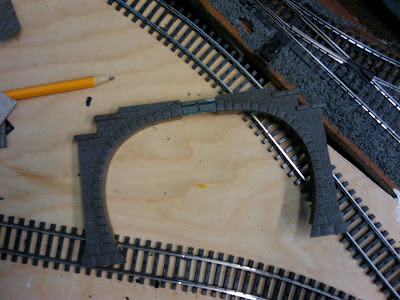 The entrance to staging is double-track, in a curve, and there is a curved turnout leading to Prechtal. It's also below Emsingen yard, so not that accessible. And, just like everywhere else, there's not a whole lot of space. The original plan was to use two tunnel portals, and stagger them. When I tried to set this using the plastic portals I have, it didn't quite work out. 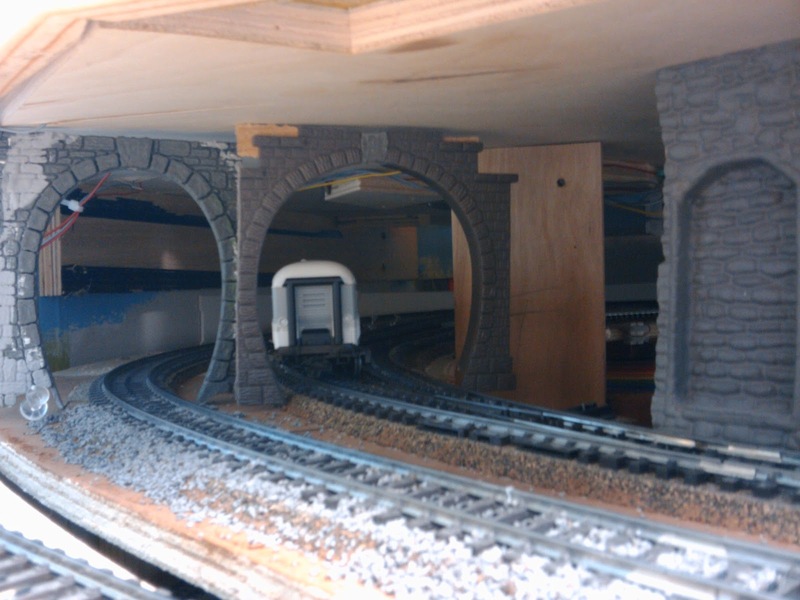 Clearance between the tracks is too tight, and the single track portals are not wide enough to be set over the curved turnout. I modified one of the portals, but it didn't look particularly good with half of the portal stone missing. So I went to plan B: modify a double-track portal, and make it extra-wide so that it fits over both tracks and there's enough clearance at the turnout, too. I inserted two crown stones from another portal and glued everything together. The picture on the left shows the result. A big gaping hole. Might as well not have a tunnel portal here. Meh, I don't like the look of this at all. Additionally, I tell my operators switching in Talheim they can operate between the tunnel portals. However, now there is not enough space for a locomotive to fit between the turnout in the foreground and the tunnel portal. And I can't put the "Halt fuer Rangierfahrten" sign just outside the portal. There must be a better way to do this. 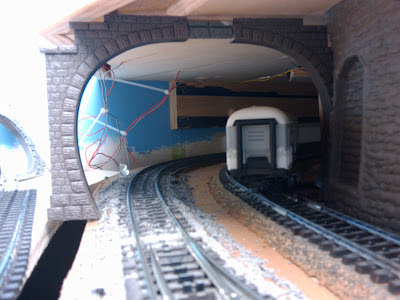 I went back to the single-track plastic portals, but replaced the one over the curved turnout with a cardboard template again. Then I started experimenting with positioning so that my longest passenger car would still comfortably fit through the opening and the portals would use the area where the tracks are diverging a bit as originally planned. 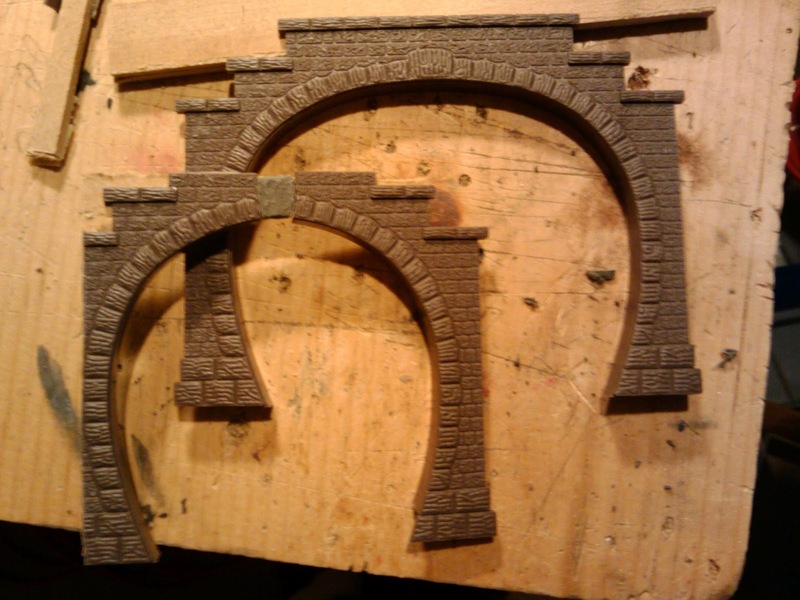 Eventually I had worked out the right position and dimensions for the right-hand portal, and cut down the extra-wide double-track portal to an extra-wide single-track portal. Much better. The two portals are offset by only 1.5 inches, and are now set much further down under the yard than originally thought. The gap between the wall on the right, and the right-hand portal is about 4 inches. 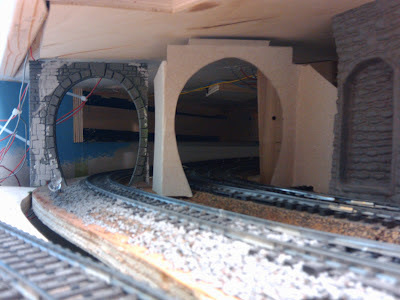 There is not enough space between the tracks to allow for proper stone wall next to the portal without affecting clearance on the neighboring track. Something to keep in mind for the next layout.